This fishing venue is along side the wharping drain river, consisting of 2 lakes side by side in the form of kidney beans back to back which gives them a little character. 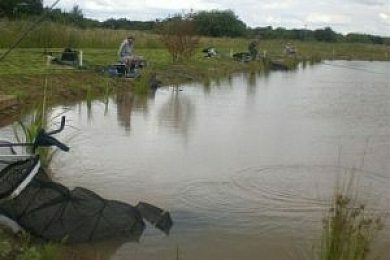 Anglers can drive to each and every peg which are also concreted for stability. Each lake also has an under water island for the fish to come up and feed within the warmer waters. This is also accessible to all anglers and is ideal for pole fishing wagglers or feeders. This venue is very tranquil with lots of wild life and plenty of fish. Owston Ferry Fisheries 9 out of 10 based on 1 ratings. 1 user reviews. Spent a pleasant days fishing here landed 2 nice fish only my second day of being a fisher man. Area is clean and peaceful owner is a good natured fellow and very helpful. Told during summer BBQ's are held. A very good place weather seasoned or just a beginner.